On Black Friday there are going to be some people who are kicking back their favorite chair with a turkey sandwich in hand. They’re not the ones who are going to be awake in the dark of the morning huddled in a shopping center parking lot, waiting for the stores to open with their doorbuster deals. 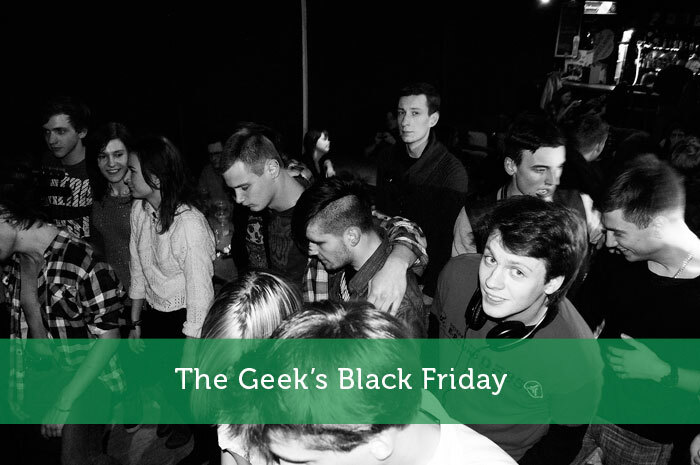 The geek, and an increasing number of non-geeks, will be relaxing all weekend in order to prepare for the geek’s Black Friday; Cyber Monday. Business Week, retailers that benefited most were the ones who catered to people accessing their websites via mobile devices, which accounted for 32 percent of site visits. This was a 45 percent jump from the previous year, and there is every expectation, as phones and tablets drop in price and become more widely available, that this trend will continue. Cyber Monday, less than a decade after its founding, has become a tremendous deal to all online retailers and wholesalers. Catering to the Gen X and Millennial geek population would seem to be where the smart money is, and it is projected that online shopping and eCommerce as a whole will continue to increase its share of overall retail sales. While Amazon and eBay were the big names in the news, they were joined by millions of online stores from the very big to the very small specialty retailers hawking their wares from eCommerce platforms. The power surge was such that consumers were actually siphoned away from the big box stores in their shopping center locations. ECommerce as a whole is growing as well, edging up year after year. The worldwide demand for goods and services saw $1.2 trillion in business to customer eCommerce, with over 29 percent of that coming from consumers in the United States. Online shopping, according to Statista, accounted for 10 percent of US retail revenues on its own. Getting in on the eCommerce boom has been beneficial for specialty retail that might not otherwise have any other outlet other than a small, local brick and mortar store. Putting out a virtual storefront opens your store to the rest of the world, and it has become much easier to do so. ECommerce platforms catering to small and specialty retail stores have proliferated in just the past five years, allowing small businesses access to big business web store options. Antiques and vintage merchandise including clothing, toys, books, and other items. So as you can see, these are items that you might not otherwise find at a Bloomingdale’s or at a Walmart. These items tend to have very specific audiences, and your best audience may be looking for you online. Bringing your store online is not as difficult as you might think. Many stores have opted to use eCommerce platforms such as Shopify in order to launch their Internet portals. ECommerce platforms provide tools previously only available to the retail and wholesale industry’s biggest names. However, it is possible for even a modest store to have access to the same exposure as a much larger business with a much larger budget can command. So aim for your target audience; the relaxed Cyber Monday geek at work trying to decide between maybe getting that new game console or picking up that item you have in stock that no one else has. You will find that they are just as intensely competitive as the doorbuster-seeking Black Friday bargain hunters. Don’t forget to format your site for tablet and phone users who may be doing their shopping on the fly or on the sly while at work. It seems the big retailers are trying to counter this by having Black Friday sales earlier and earlier in the week. I think eventually Black Friday as we have come to know it will not exist. Especially in cold areas of the country, waking up in the middle of the night in freezing weather seems more and more unappealing. We took to Amazon for most of our Black Friday sales last year. It’s great to be able to buy online without the headache of dealing with Black Friday Fever. Though we do usually head to Walmart later in the morning to get the small sales, like DVDs and kitchen appliances. That stuff is still there! Black Friday isn’t as big up north yet, but Cyber Monday is really catching on! I don’t get into any shopping experience that requires me to make a snap decision. I like to take my time, compare/contrast and research my purchases. There’s a reason why the sales quick, fast, and quantities are limited – they want you to make the purchase without thinking about it. That’s never good for the consumer.